You and your team have just wrapped up Q2. The sun is out and the weather is nice, leaving your reps doing more daydreaming about a pool day than focusing on pipeline growth. 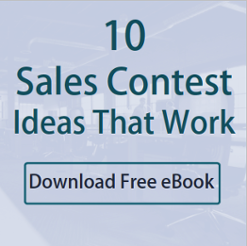 Use summer-themed sales contest ideas to bring them back. Goal: Drive new business by putting this golf-inspired sales contest into action. Focus your team on getting meetings booked and winning deals. Goal: Ride the pipeline, dude! Use this sales contest to motivate your team to convert leads into opportunities. Goal: Get your team to cook up some hot leads by grilling the competition. Use the competition field in your CRM system to find a list of leads lost to competitors and start calling! Duration: One day. Break for hot dogs and hamburgers at lunch to view the sales leaderboard and discuss best practices. Then back to the phones! Goal: Use a fishing-themed contest to get conversations going and reel in decision makers. Make sure your sales team is getting on the phones with the right people. Goal: Make sure your team reaches out across different locations. Base this contest around conversations with a lead from each state. Duration: One to two days, depending on how long it takes for someone to reach a prospect in every state. Use these summer sales contest ideas to keep your team focused during this slack-off season.